free shipping, free installation, and zero maintenance costs. And now, with the all‑new TracPhone® HTS‑series, connect with data rates as fast as 20 Mbps, plus get an Unlimited Use data channel. Offering your fleet everything it needs to compete today, AgilePlans® by KVH is an all‑inclusive, no commitment service including: global broadband, VSAT hardware, daily TV and print news, training, free shipping, free installation, and zero maintenance costs. And now, with the all‑new TracPhone® HTS‑series, connect with data rates as fast as 20 Mbps, plus get an Unlimited Use data channel. Rely on years of trouble‑free service with the system that meets your fleet’s needs: the groundbreaking 60 cm TracPhone V7HTS or the dual‑mode 1 m TracPhone V11HTS. Enjoy free shipping to your vessels and free AgilePlans Standard Installation1 in select ports around the globe and up to a US$2,000 per vessel credit toward installation elsewhere! Find out more about AgilePlan ports and how we make installation hassle‑free. The TracPhone V11HTS and the TracPhone V7HTS each offer KVH’s exclusive dual channel configuration with innovative hybrid airtime plans that deliver an unlimited use data channel running at the same time as the high speed channel offering blazing fast network speeds as fast as 20 Mbps/3 Mbps (V11HTS) and 10 Mbps/3 Mbps (V7HTS) down/up. 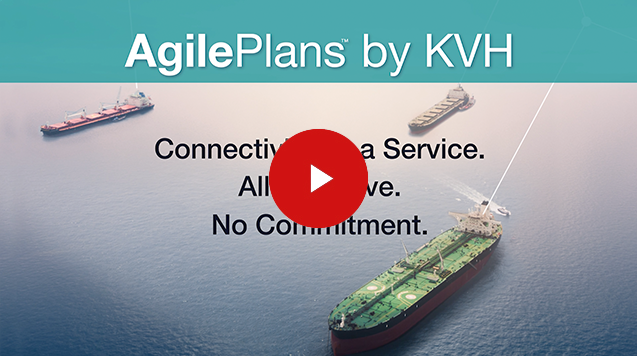 KVH’s AgilePlans Multicast Channel delivers up to 150 GB of crew welfare and operations content every month with no impact on your data speeds or monthly data plan. Optimize your SATCOM availability with the KVH OneCare™ Global Technical Assistance Package, zero maintenance costs for as long as you subscribe, and KVH Proactive Performance Monitoring, an industry first. Manage your service, maximize your uptime, and minimize costs via the secure myKVH Portal and the mini‑VSAT Manager™ suite of tools to enjoy unmatched control over your data and how it is used. Plus, our integrated cybersecurity systems use advanced network‑level firewall and automated threat management to help ensure the confidentiality, integrity, and availability of your data within the network. Keep your crew connected to events at home and improve crew retention and morale with daily world and national news via NEWSlink™ TV and NEWSlink Print. Boost your crew’s productivity while reducing risk, thanks to the KVH Videotel™ Basic Training Package. Choose from one of three 20-video STCW‑related programs: Tankers, Dry Cargo, or Offshore Vessels. 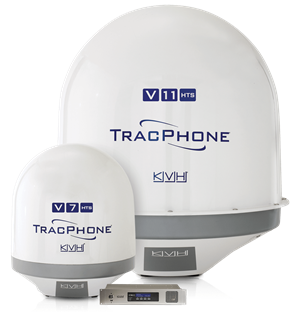 Plus, every TracPhone VSAT system now includes Videotel’s “Cybersecurity at Sea” Training program, part of KVH’s cybersecurity solution. 3 Requires separate license and/or subscription from C‑Map. Subscriber to obtain at own expense. 4 Requires separate license and/or subscription from StormGeo. Subscriber to obtain at own expense. Boost your crew’s productivity while reducing risk, thanks to the KVH Videotel™ Basic Training Package. Choose from one of three 20‑video STCW-related programs: Tankers, Dry Cargo, or Offshore Vessels. Plus, every TracPhone VSAT system now includes Videotel’s “Cybersecurity at Sea” Training program, part of KVH’s cybersecurity solution. A single low monthly subscription fee covers hardware, airtime, global service, and a host of powerful value‑added services that will change how you do business at sea. And while we’re confident that AgilePlans from KVH will be the ideal CaaS solution for your fleet, we do know that your situation is always evolving. That's why you can end your subscription at any time without penalty. Simply notify KVH, return the hardware to us, and your subscription will be closed. And now offering TracPhone V11HTS with download speeds as fast as 20 Mbps! © 2019 KVH Industries, Inc. mini-VSAT Broadband is a service mark of KVH Industries, Inc. KVH, AgilePlans, Videotel, TracPhone, IP-MobileCast, NEWSlink, CHARTlink, TRAININGlink, FORECASTlink, SPORTSlink, MOVIElink, TVlink, and MUSIClink are trademarks of KVH Industries, Inc. All AgilePlans subscriptions are subject to the terms of the AgilePlans by KVH Service Order and Master Services Agreement. All other trademarks are the property of their respective companies.